The item’s owner, Timothy Fugmann, contacted me in September, 2007, to ask for my assistance in identifying the artifact. Since I did not recognize the object, I made some inquiries. History Detectives concluded that the item was likely taken from the crash site of the Hindenburg. I submitted detailed photographs to Jürgen Bleibler and Barbara Waibel from the Zeppelin Museum and Luftschiffbau Zeppelin archives. Both Mr Bleibler and Ms Waibel told me that they had never seen an instrument of that type before, and I forwarded their emails to Mr. Fugmann. Since Mr Bleibler and Ms Waibel are experts in the field, who are familiar with the wealth of information held in the Zeppelin archives, I told Mr Fugmann that if neither of them recognized the artifact, I doubted it could be from the Hindenburg. I thought the inquiry would likely end there, but the artifact later appeared on History Detectives, whose producers concluded that the item was most likely from the wreckage of the Hindenburg. The producers of History Detectives made no mention of the doubts raised by the experts in Friedrichshafen (but in fairness to the producers, it is possible Mr. Fugmann did not mention our correspondence). “The History Detectives folks asked me to take a look at this thing, and I did. I worked hard to find it in our extensive Hindenburg files, and even searched the National Archives. I could not place it aboard the airship, so they didn’t interview me. 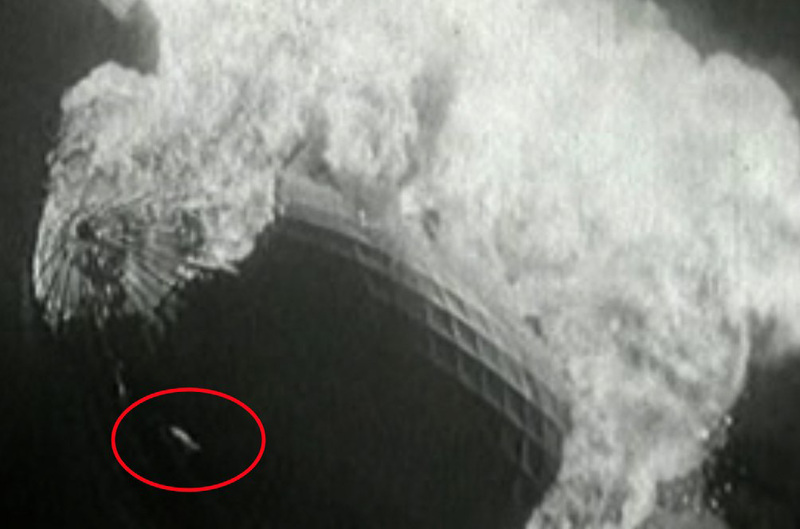 Could this really have been unscrewed from the Hindenburg’s wreckage? One other question, which was also not explored by the producers of History Detectives, is that the item seems to have been carefully unscrewed from wherever it was attached, with the screws then reinserted. This did not seem consistent with the information Mr Fugmann provided to me about the item having been surreptitiously stolen from the accident scene; carrying off a scorched spoon or piece of girder from the wreckage is one thing, but carefully unscrewing an instrument from the ship’s control car seems like quite another matter (with regard the time it would have taken to remove the object from its mounting, the likelihood of doing so unobserved, and the potential penalties for removing an object that any thief would have assumed might be important in the investigation of the crash). Nor did the producers of History Detectives do a lot of research into the manufacturer of the object, C.P. Goerz. Goerz was best known as a maker of cameras and lenses, and also other optics (especially for the military), but the firm also made calculators and aeronautical instruments, including altimeters for WWI zeppelins (see photo). However, Goerz was merged with other firms to create Zeiss Ikon in 1926, and whether the company continued to use the name “Goerz” on items made after 1926 was not explored by the producers of History Detectives; reader comments on this question are welcomed. On the other hand, in support of the possibility that the item was used on an airship. As my friend Rick Zitarosa, the extremely knowledgeable historian of the Navy Lakehurst Historical Society, pointed out during the History Detectives episode, the speed values on the instrument roughly match the speed of an airship. And if the lower scale (“stopping time in seconds”) represents the time it takes for a dropped object to reach the ground, the 5-20 second range roughly approximates the typical altitude of an airship. (Without accounting for friction, an object will fall approximately 400’/120m in 5 seconds, and approximately 2100’/700m in 12 seconds.) And the stopping time increments decrease as the values increase, which also makes sense if it were used to measure the height of a dropped object, since objects fall with increasing velocity (until reaching terminal velocity, of course). So could this item have been used to check altitude? (It is known that German airships used barometric altimeters, a sounding device known as an echolot or echolade, and the simple technique of dropping objects and timing their fall.) Or could the item have been used to measure drift, or as a way to double-check ground speed? Of course, even if this instrument were designed for use on an airship, whether it was taken from the wreckage of the Hindenburg is another matter. The following photographs and information are presented so that readers can examine this artifact more closely themselves, and in greater detail than is possible from watching the episode of History Detectives. The instrument is approximately 15cm wide x 9cm high x 4cm deep. "Geschwindigkeit für Meßtrecke gleich der Höhe." The values range from 4 to 20 in increments of  decreasing size. 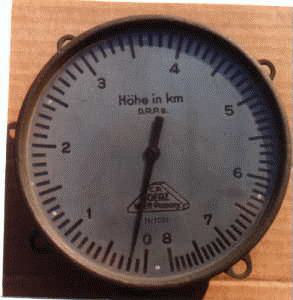 To the left is a small box marked "Höhe" (height or altitude). The manufacturer was "C.P. Goerz, Berlin." The ending to this story is sort of sad – after the taping of the show, this piece was stolen from the back seat of a cab and hasn’t been seen since. My brother Tim has been looking for it, but to no avail. Oh gosh, I am so sorry to hear that! Thanks for letting me know what happened, and say hello to Tim for me. Thank you for adding your thoughts and comments to the page.